Switch out a few gadgets. Don't think that you have to give up all your appliances or electronics. Keep the ones that make your life easier. No one really wants to wash the family’s laundry by hand on a washboard, aka “knuckle buster.” Modern appliances were made to reduce your workload. However, you can add a little more fun by hanging up a clotheslines to dry the wash, or turn to a man-powered lawn mower instead of gas-powered one. As with everything, it's about moderation. Create an at-home swimming hole. Place inflatable pools in the yard and fill with water. Have a wading pool party instead of traveling to a beach or public pool. Backyard barbecues and garden parties never went out of style: they are inexpensive and a great reason to invite friends over for a fun day. Take time to sit and read a book with the family. Have one person read a page or two as you pass the book around. Have everyone sit at the table for dinner and discuss the content together. Plan weekends just for the family; no outside visitors allowed. This helps families bond together. Reading a book together can be especially bonding. When possible, cook meals from scratch instead of from ready-made mixes and cans. Cooking from scratch is nowhere near as hard or time-consuming as people might think. Part of the fun is taking your time to get there. Plant a flower garden around the house. In an apartment, container flowers grow well. Fill the house with cut flowers from the garden. Place crocheted doilies on the backs of couches, chairs, under vases and so forth. These are great stylistic touches and are inexpensive to find at flea markets and thrift shops. Cookies, cakes, pies and pastries taste far better when made from fresh ingredients. Choose old-timey recipes you used to love as a child. They have more character and taste than store-bought goods. Use butter instead of margarine, just pay attention to serving sizes. Have fun while baking--put on an old-fashioned apron. Everyone will love your retro look! Research and learn old-fashioned skills. Crochet, knitting, sewing and other old-fashioned skills were used to make clothing and home decorations for generations of families. It can work for you too. You can also learn how to arrange flowers instead of hiring a decorator. 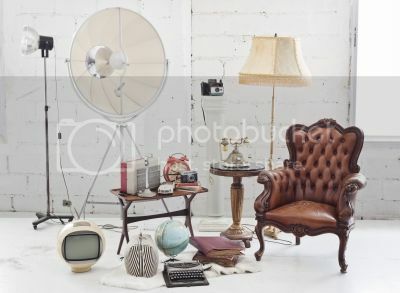 Decorate your home with retro and vintage items found at garage sales, flea markets, thrift stores and other places. The idea is to be DIY, Do-It-Yourself whenever possible. You can live an old-fashioned lifestyle without spending a fortune and without relying too heavily on the help of gadgets and assistants. Sometimes it's best to get your own hands in the materials of life and make the stuff you need yourself. This will help you to slow down, notice the roses and enjoy them. Becky Wilcox is a freelance writer who has a passion for education and technology. In her spare time she loves to experiment with new dishes in the kitchen and maintaining a healthy lifestyle.